Hendrick's uses a blend of spirits produced from a Carter-Head Still (constructed in 1948), of which there are only a small number in the world, and a small pot still, originally built in 1860 by Bennett, Sons & Shears. Both have been restored to working order after being bought at auction in the 1960s by former William Grant Life President, Charles Gordon. The two stills produce strikingly different styles of gin due to their different construction and methods of distillation. The pot still is generally referred to as the Bennett still. The still itself is quite small, which in general will allow most of the flavour characteristics of the botanicals to pass into the spirit. The still is charged with neutral spirit and the botanical recipe added to the liquid, along with some water. This is left to steep for 24 hours, which begins the process of extracting the flavour from the botanicals. The still is then heated by means of an external steam jacket to boil the liquid. As the pot begins to boil, vapour moves up the short column of the still and eventually meets the condenser, where vapours are turned back to liquid and collected. First runnings can be as high as 92% alcohol, with a gradual decrease in the strength as the distillation progresses. Once all of the alcohol is collected, the final spirit will be approximately 75% alcohol v/v. This spirit is of a heavy, oily character with a strong juniper-flavour. In contrast, the spirit derived from the Carter-Head still is much subtler with light floral and sweet fragrances. Its method of production is quite different, with only the neutral spirit and water added to the pot of this still. All botanicals used with the Carter-Head are added to a flavour basket at the very top of the still. Rather than boiling the botanicals, which produces the strong pungent spirit of the Bennett still, the Carter-Head bathes the botanicals in the alcohol vapours only. As these rise up through the still, they enter the base of the botanicals basket. Inside, the botanicals are contained in copper baskets, which hold them together while allowing the vapours to be fully exposed. As the evaporated alcohol moves through the botanicals it efficiently extracts flavours from them, which are carried out of the basket along with the alcohol until they reach the condenser. Only the lighter, sweeter and floral flavours are able to be extracted by this method, which gives the spirit its distinctive character. 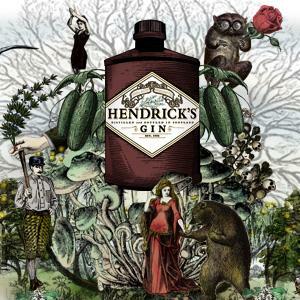 The final Hendrick's gin is a blend of these two spirits with an addition of cucumber essence and rose petal essence.